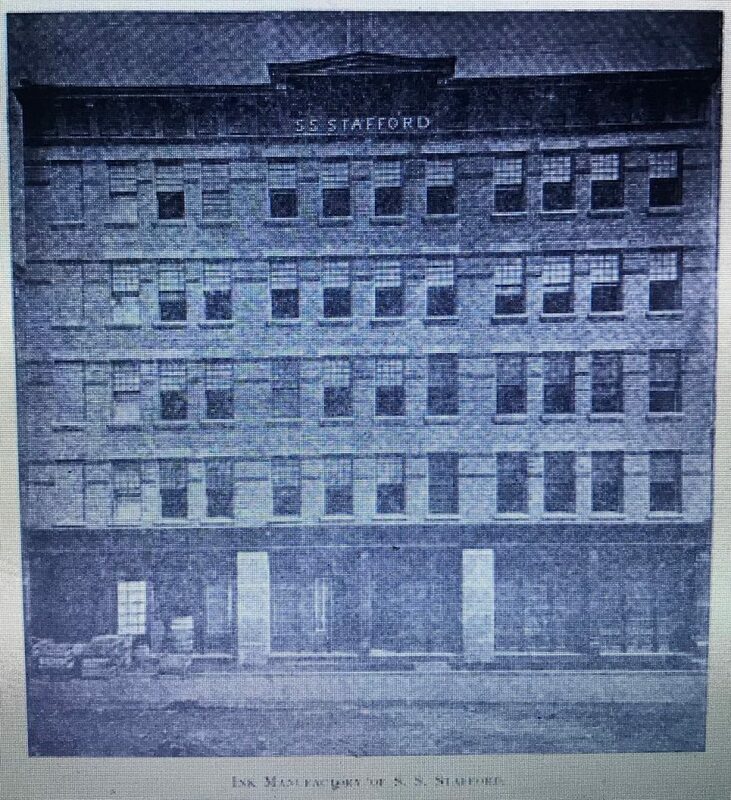 Primarily known as an ink manufacturer, S. S. Stafford, Inc. was founded by Samuel Spencer Stafford. His February 16, 1895 obituary in the New York Times mentioned his early years as well as his entrance into the ink business sometime in 1858. He was a graduate of Union College, and also of the Albany Medical College, but he did not practice medicine. When Dr. Stafford received his medical diploma, in 1849, the California gold fever was at its height, and Dr. Stafford went to San Francisco, where he remained until 1854. In that year he returned to New York, and four years later he engaged in the manufacture of ink. In 1858 S. S. Stafford bought the trade mark and stock of Conger & Field, who were the first to make a writing fluid in this country. Their business had dwindled to small proportions and it was not long before Stafford’s inks were better known than those of his predecessors. Conger & Field was listed in the New York directories as “ink,” and located at 212 Broadway (1856-57) and 52 William (1857-58 and 1858-59). The proprietors were Genet Conger and George W. Field. I have to believe that they became acquainted with Stafford sometime around 1857 when they were neighbors or possibly shared a building at 52 and 54 William. After purchasing Conger & Field, the NYC directories, listed Stafford as a “stationer,” located at 42 Cedar St (1859 -60) and later as “ink” at 84 Cedar St. (1860-61.) By 1861-62 he was listed at 11 (sometimes 10) Cedar St. where he remained until 1870. Sometime in early 1870 the business moved to 218 Pearl Street where it remained until 1886. At that time, according to the 1888 “American Stationer” feature, he built a factory at 601 – 609 Washington Street. The present manufactory, of which an illustration is given, was erected by Mr. Stafford in the Spring of 1887 upon land which he purchased. It is a plain brick structure, five stories high, 75 feet wide and 80 feet deep. Including the basement there are six floors, all of which are used in the manufacture of Stafford’s inks and Stickwell’s mucilage. The establishment is fitted with the best machinery and appliances for turning out perfect and uniform goods. After Samuel Spencer Stafford’s death in 1895, his son, William A.H. Stafford, took over leadership of the company. According to his obituary in the January 17, 1911 edition of the Brooklyn Daily Eagle, he had entered the business in 1872 at the age of 16. The company apparently incorporated in New York sometime in 1903. The company was listed as a New York corporation in the 1904 NYC Copartnership and Corporation Directory with a capital of $250,000. William A H Stafford was named president, William B Montgomery, secretary and Robert Bachia, treasurer. Following William A H Stafford’s death in January of 1911, his son, William S Stafford assumed the presidency. 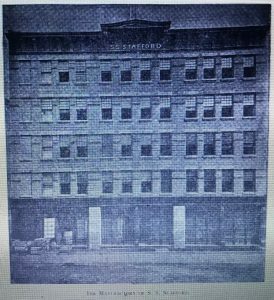 Owing to a great increase in its carbon paper and typewriter business S.S. Stafford, Inc. has moved that department to 129-135 Charlton Street. The quarters which the company has occupied for many years at 601-609 Washington Street are now devoted entirely to the making of writing inks and other well known specialties made by the concern. Six years later, according to an April 1920 item in “Walden’s Stationer & Printer,” the company purchased three buildings adjacent to their Washington Street building effectively consolidating the business at that location. This provided them an address on both Washington Street and 622 Greenwich Street. 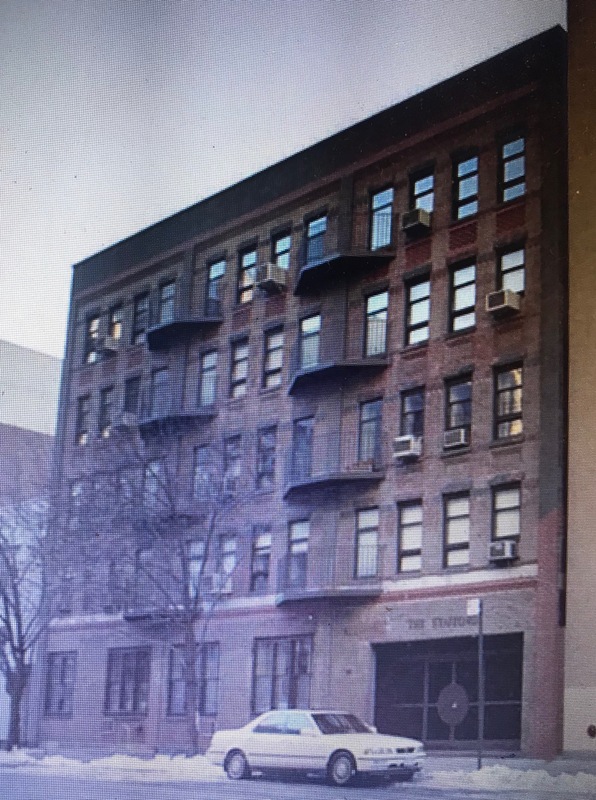 S.S. Stafford, Inc., manufacturers of writing inks and adhesives, located at 609 Washington Street, New York City, have recently purchased three buildings in the rear of their present premises. The additional space will be combined and connected with their present home, giving them 33,000 square feet of floor space and making the line covered by their buildings 94 x 184 feet. 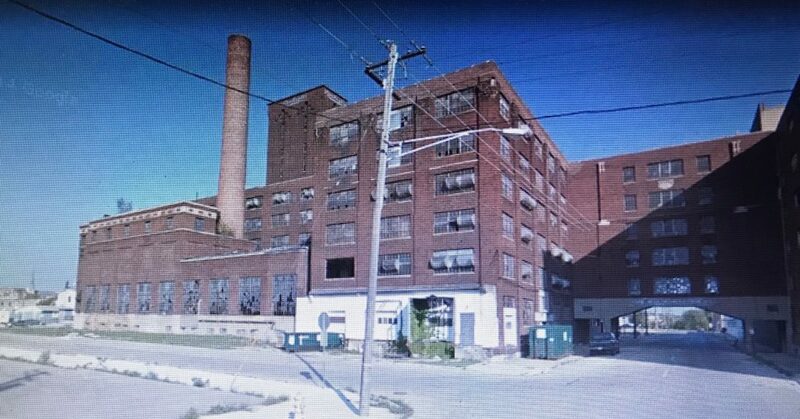 The carbon paper plant operated by the company at 129 Charlton Street will be removed to the new building and also outside storage space which is being used will be relinquished as fast as the leases on the same expire. “The new arrangements will greatly economize the handling of raw materials and enable us to take care of the enormous increase in our business,” the company said. In addition to their New York location, this 1914 advertisement also mentioned a Toronto, Canada location. Other advertisements around this time included the Toronto address as 9 Davenport Road. 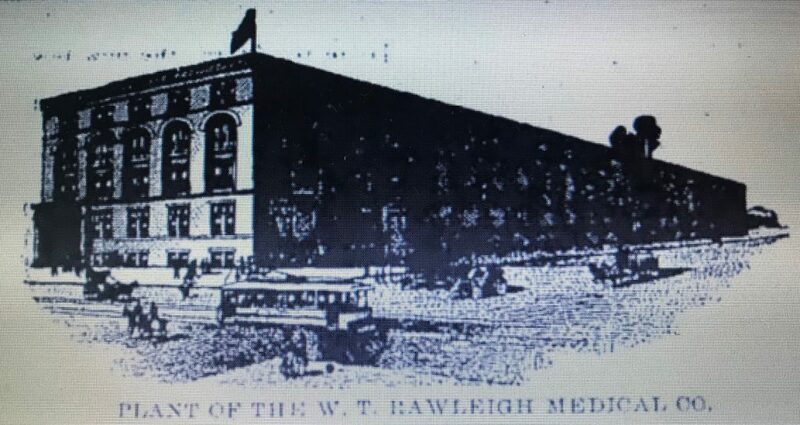 Later, by the early 1920’s they also added a Chicago location at 62 West Kinzie. Through the 1920’s their menu of products continued to expand. 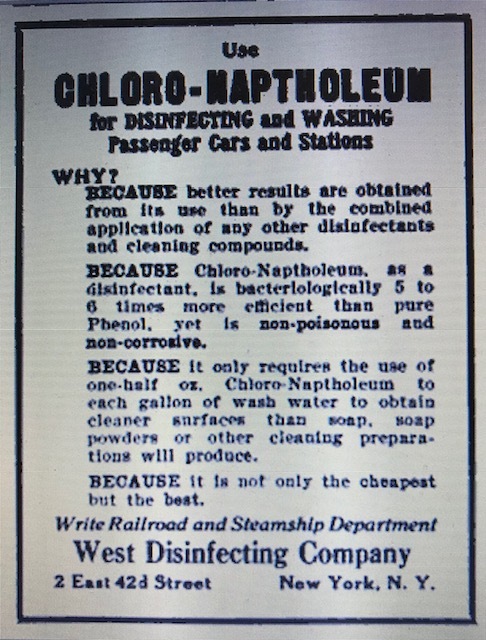 As evidenced by this advertising item in the June 10, 1928 edition of the “Austin (Texas) American Statesman,” much of the growth was fueled by the proliferation of the automobile. The comprehensiveness of the Stafford output is witnessed by the following enumeration of their various lines, which include writing and copying inks, paste, mucilage, glue, indelible ink, show card colors, stamping inks, stamp pads, typewriter ribbons and carbon papers, furniture and automobile body polish, and 15 other chemical automobile products including radiator stop leak, penetrating graphite oil, cushion dressing rapid repair and engine enamel, gasket shellac, gasket cement, etc. 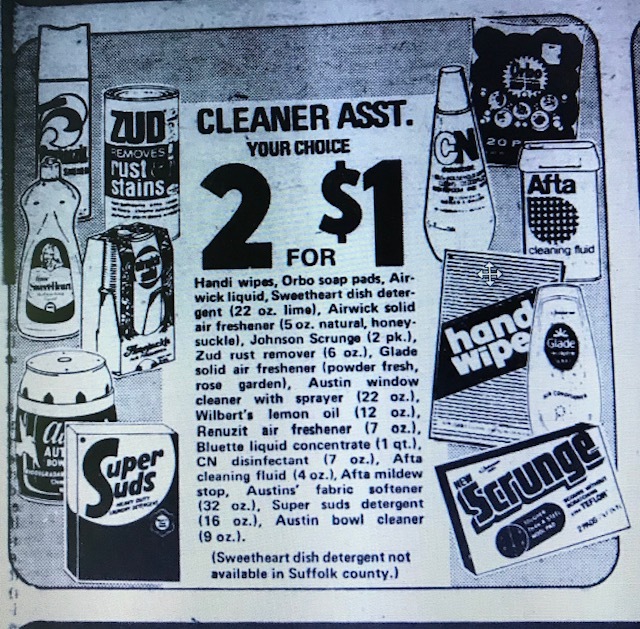 This menu of products not withstanding, there’s no doubt that the head of the product family was always ink and they made many different types. The “Stationary and Printing” section of the 1890 edition of “Seeger and Guernsey’s Cyclopaedia of the Manufacturers of the United States,”named them as manufacturers in the following subsections: Writing Inks, Carmine Ink, Colored Inks, Copying Inks, Indelible Inks, Rubber Stamp Inks, Safety Inks and Stylographic Inks. 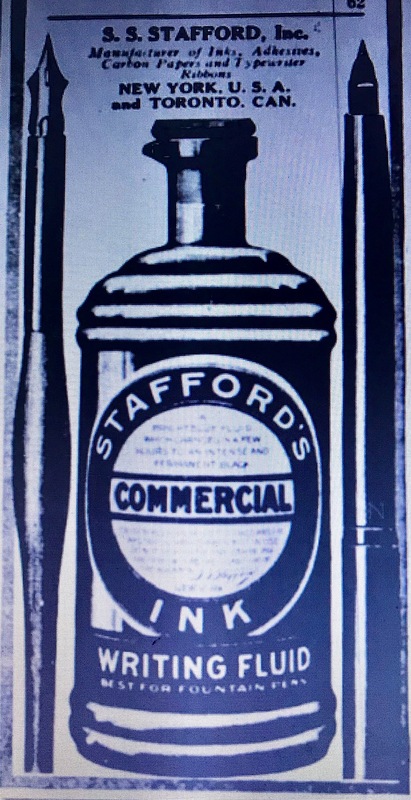 In the teens and early 1920’s, the product that Stafford’s primarily advertised was called Stafford’s Commercial Writing Fluid. 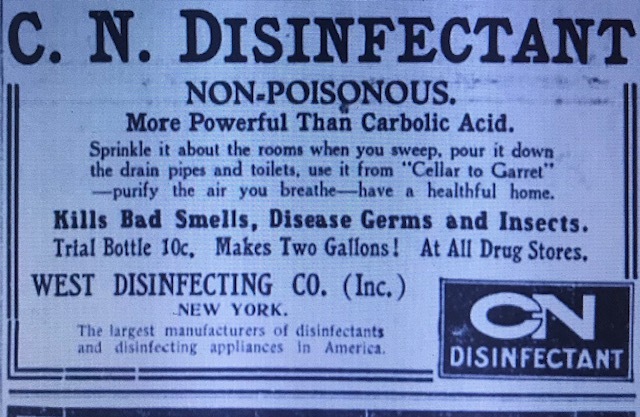 A March 15, 1919 advertisement in the Saturday Evening Post called it “The Ink That Absorbs Moisture From The Air” and was typical of their advertisements around that time. Do you just buy “ink” – pallid liquids which write a sickly color – which soon corrode your pens – and which, worst of all dry up in your inkwell quickly, leaving a thick, clotted residue and caked particles on the side of the well? 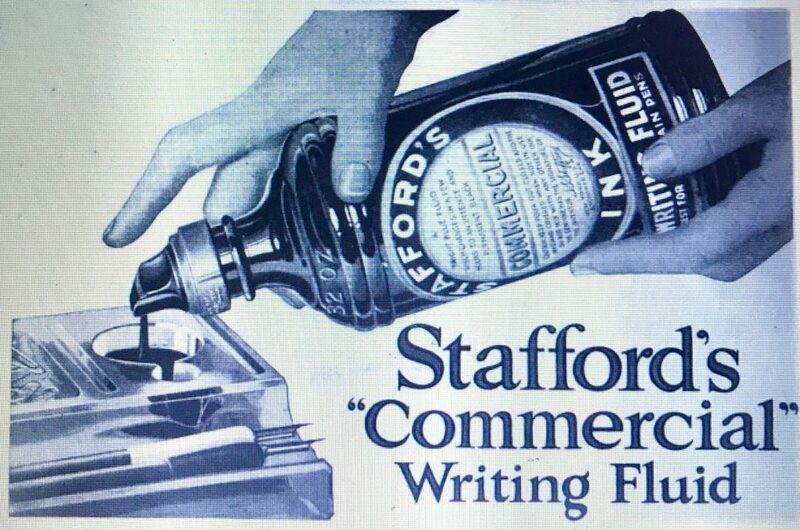 Or do you insist on Stafford’s Commercial Writing Fluid – the ink that absorbs moisture from the air? This peculiar property of Stafford’s Commercial is the reason why it is so slow to evaporate in the inkwell, why it continues to flow smoothly after ordinary inks have become thick and unfit to write with. This is one of the most important discoveries in the history of ink making. It means a real savings for you. There’s another reason for using Stafford’s Commercial. It has a strength of color which inks have lacked since the dye situation became so involved. American color makers have at last solved the problem. For Stafford’s is brilliant blue when you write and turns permanent black in a few hours. 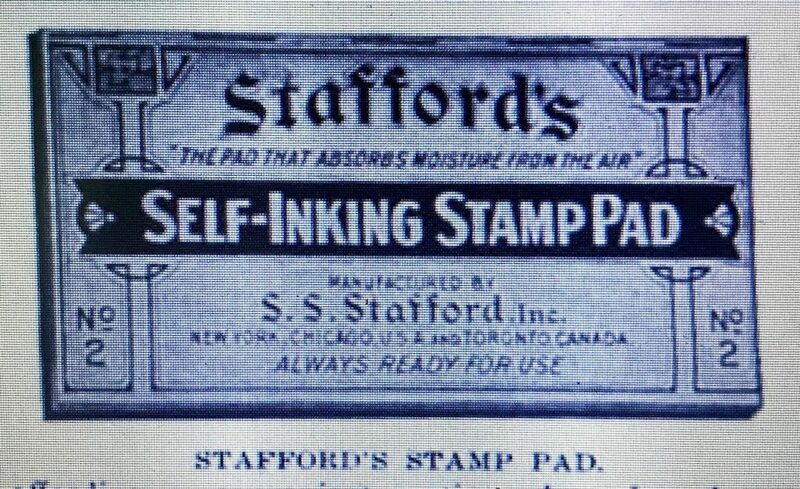 The following item regarding Stafford’s Commercial Ink appeared in the June 16, 1917 edition of the “American Stationer and Office Outfitter.” I was attracted by the historical perspective it provides of the World War I era and will let you decide whether or not it’s true or just advertising in disguise. The following letter was recently received by W.S. Stafford, President of S.S. Stafford, Inc., manufacturer of Stafford’s inks, etc., of 103 Washington Street, New York. The original letter is now at the New York office and establishes the fact that the permanent characteristics of Stafford’s ink have not been affected by the exigencies of the war. Dear Sir: – It may interest you to know that I sent a letter to my daughter in England, bearing date, February 25, 1917. The letter with the rest of the mail went down on the “Laconia” which was torpedoed. Some of the mail bags were washed ashore with the wreckage. The letters then, which had legible addresses were forwarded on their journeys, mine reaching my daughter. The writing in the letter is blurred but readable – the envelope which she returned to me to see shows the address perfectly clear, the ink not even dimmed, although it had a bath in sea water. The ink I used was Stafford’s Commercial Fluid which I bought at the White House, S.F. I was so pleased to see the address looking perfectly good after such a test, that I thought I would let you know about it. The S.S. Stafford Company has recently started the manufacture of stamp pads on a strictly quality basis. Only the finest quality of felt blotting paper and nainsook enter into the manufacture of these pads, while the inks with which they are saturated are made with the finest dyes obtainable in a glycerine solution insuring the longest life possible. As the use of fountain pens decreased, it was probably the addition of stamp pads that kept the company in business. They’re still listed at their long time location (Office: 622 Greenwich and Factory: 609 Washington) in the 1960 Manhattan telephone directory. According to his obituary, William S Stafford was still president of the corporation at the time of his death on November 6,1943. It’s not clear who ran the company after he passed away. One internet source mentions that Stafford’s was acquired by the R.T. French Company in the late 1970’s but I haven’t been able to confirm this. Today 603 Washington Street appears to be the original building constructed by Stafford in 1887 (although streeteasy.com states it was built in 1880) . It’s now a residential cooperative. According to city realty.com it was built in 1881. It’s likely one of the three buildings purchased by Stafford when they consolidated in 1920. The bottle I found is machine made with 8 oz. embossed on the shoulder. 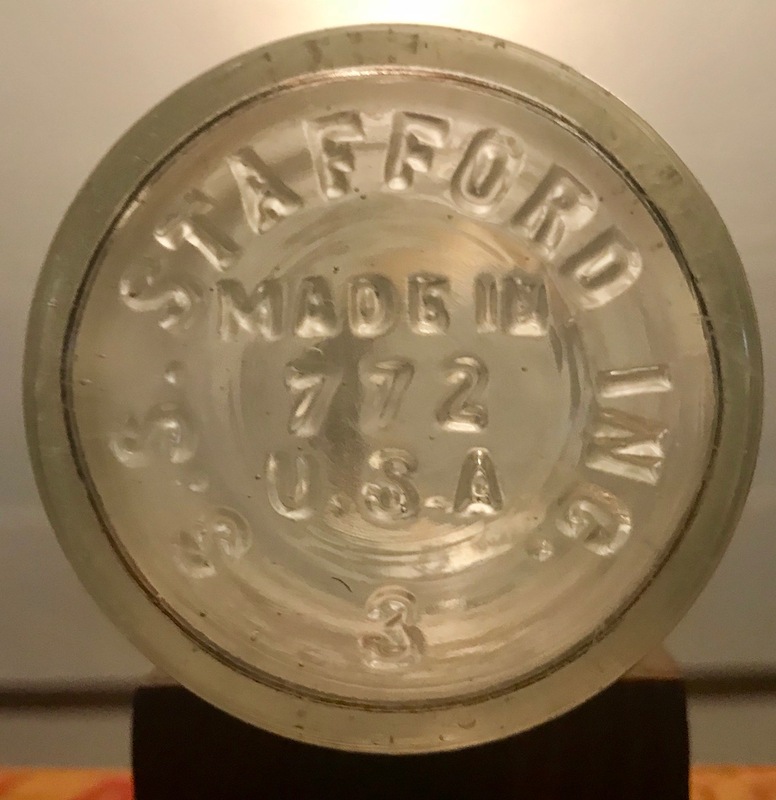 Most likely a bulk ink bottle, it resembles a labeled Stafford bottle for sale on the internet. After laborious attempts, Dr. Gude, chemist, succeeded in producing such an iron-manganese preparation, which is easily absorbed by the entire intestinal tract, evokes no concomitant effects, and, as illustrated in the following histories of cases, has proved an excellent remedy for the formation of blood. The preparation referred to is Pepto-Mangan (Gude). It contains iron and manganese in an organic combination with peptone, and is a clear fluid, resembling dark red wine, of an agreeable, non-metallic, non-astringent taste. The advantage of this preparation is that it exerts a stimulating effect upon the blood forming organs, these being excited to greater functional activity, and that the favorable effect manifests itself even within a short time by an increased oxygenation of the blood. At the same time…causes no digestive disturbances and does not injure the teeth. 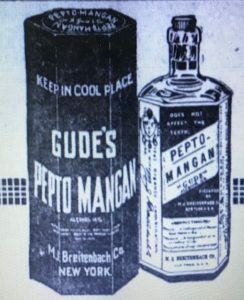 Pepto-Mangan was manufactured in Liebzig by Dr. A Gude & Company and as early as 1892, Max J Breitenbach, a pharmacist by trade, served as Gude’s sole agent in both the United States and Canada. 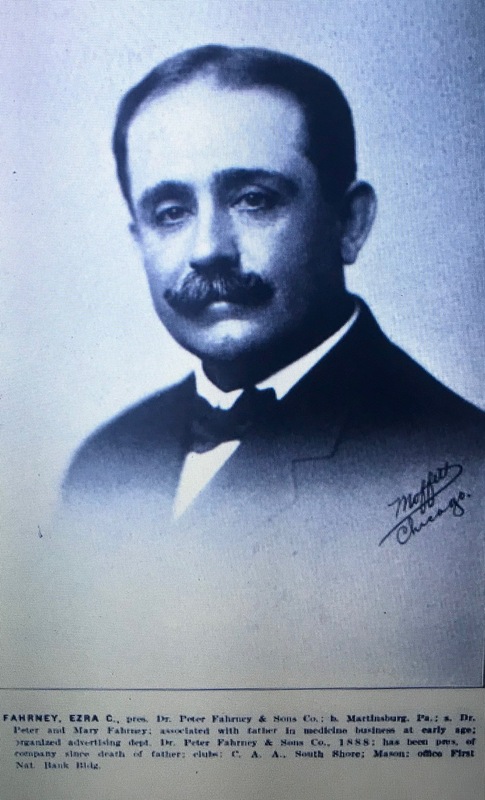 According to his obituary in the September 11, 1920 edition of the “Drug Trade Weekly,” Breitenbach was born in Albany, Georgia in 1857; came to New York in 1874 and was an 1877 graduate of the New York College of Pharmacy. The obituary goes on to describe Breitenbach’s pharmacy career leading up to his association with Peptone-Mangan. 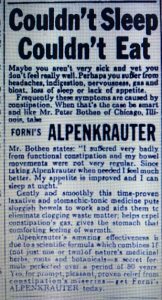 After working for a time in the drug store kept by Tsheppe & Schur at Sixtieth Street and Third Avenue, Mr. Breitenbach in 1878 took a position in the drug store of Albert Dung at Canal Street and the Bowery. Three years later he was made manager of the store and two years after that, or in 1883, he became the owner. 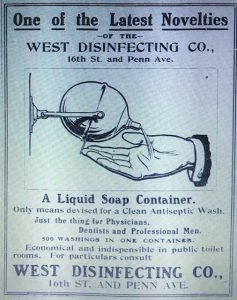 This prospered so that he opened another drug store in Madison Avenue and met with such success in this that he decided to enter the proprietary business and in 1892 he opened an office at 53 Warren Street, which he maintained until his death. 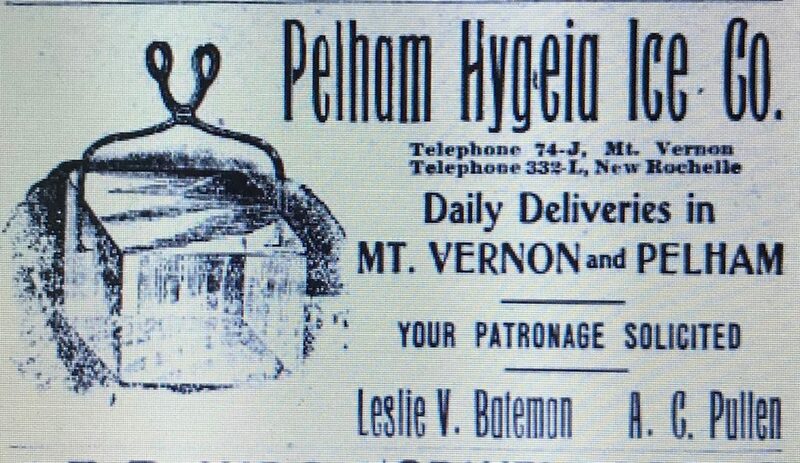 The office on Warren Street was opened primarily, if not exclusively, to facilitate the distribution of Pepto-Mangan in the United States. Breitenbach was first listed at that location in the 1894 NYC Directory (I don’t have access to 1893) and by 1896 the firm of M. J. Britenbach Co. was also listed at the same location. Around this time Breitenbach was also getting out of the drug store business. 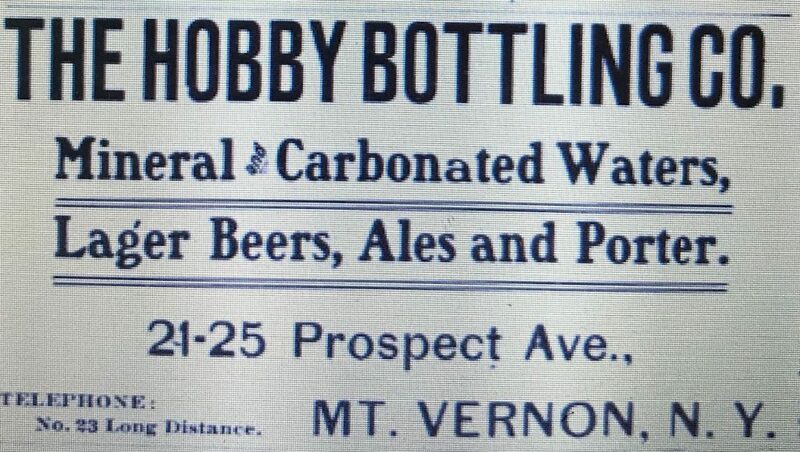 The Bowery store was no longer listed in 1894 and the Madison Avenue store, although still called Breitenbach Pharmacy, was listed with a new owner in the 1902 Copartnership and Corporation Directory. M.J. Breitenbach Co. remained on Warren Street well past Breitenbach’s death in 1920. 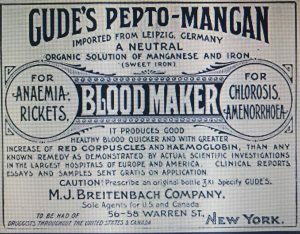 This advertisement from the mid to late 1890’s makes it clear that originally Gude’s Peptone-Mangan was imported from Leipzig, Germany. Another, from the same decade listed Liebzig as the laboratory location. As far as I can tell, this all changed around 1916 when Breitenbach purchased the entire company, including the Leipzig operation and established a laboratory in New York City. 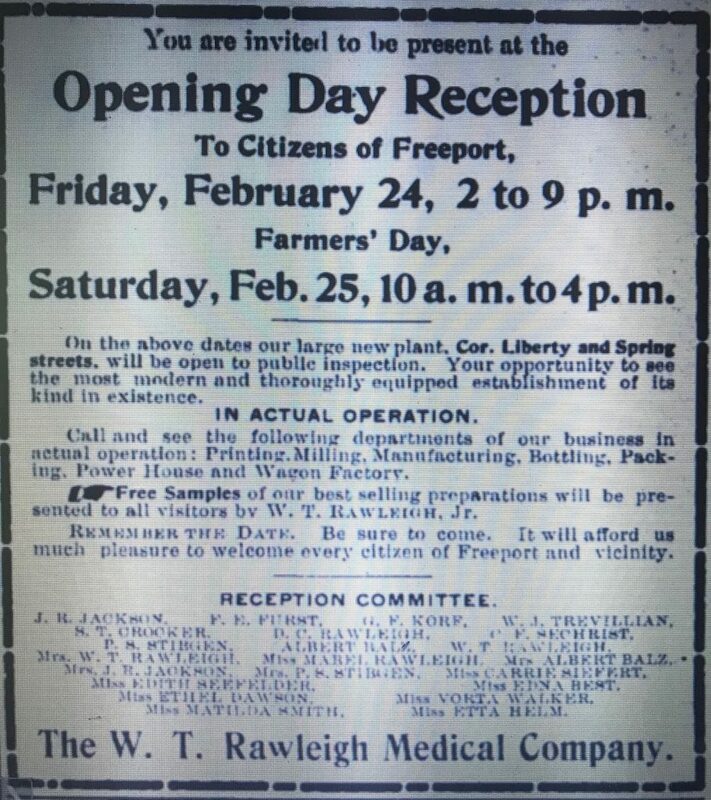 According to an item in the June 1916 edition of “American Medicine,” the company opened their new facility right around that time. 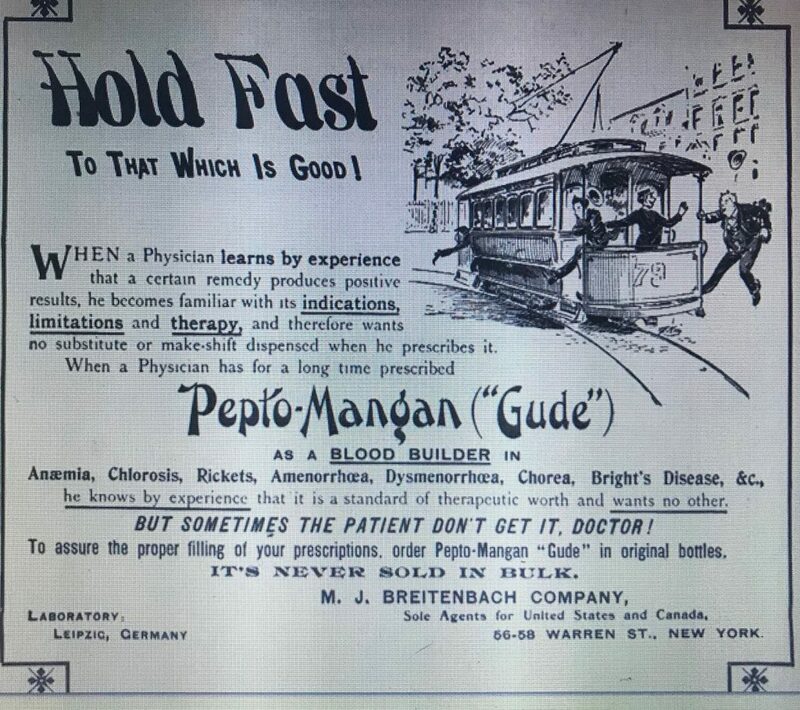 It affords us pleasure to call special attention to the advertisement of Pepto-Mangan in this issue. It will be noted that plentiful supplies of this standard hematinic are again available, after a brief shortage of stock, due to unexpected delays in the fitting up a new and thoroughly modern laboratory for its manufacture in New York City. Pepto-Mangan (Gude) is now and will continue to be owned, controlled and manufactured in the United States, and will be supplied, exactly the same as heretofore, in unlimited quantities and at the usual price. 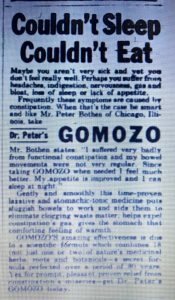 Interestingly, they blame their shortage of Pepto-Mangan on construction delays and not on the fact that their laboratory was located in Germany during World War I. 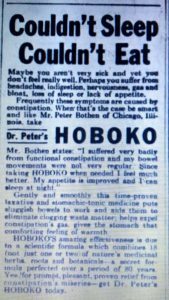 In fact, I have to believe that the catalyst for this move to America had a lot to do with World War I; a time when it couldn’t have been good business to sell a German made product in America. 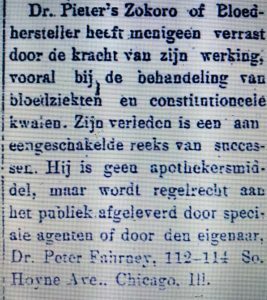 Another story, this one in the October 1918 edition of the “Pharmaceutical Record” spoke of the company’s operation during the war as well as their public relations spin at the time. 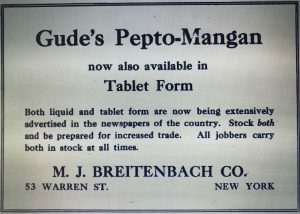 After the Germans declared war on the rest of the world, M.J. Breitenbach, who owned the American rights for Gude’s Pepto-Mangan, purchased the entire business in Leibzig, Germany. He installed his own manager there and manufactured there the product intended for use in Germany, its allies, and neutral European countries. Mr. Breitenbach supplies the American market from his laboratory in New York City, which furnishes all the product used in the United States and in the balance of North America and South America and also for the countries of the Allies. The product therefore is entirely American, even that which is made and sold in Germany being American. Of course Mr. Breitenbach has not heard anything about what has happened to his property in Leipzig since America entered the war. Presumably it has been taken over by the alien property custodian and is therefore a complete loss to him. His American laboratory, however, has been going on most successfully, and under the influence of the large sum which he is spending in popular advertising there has been a very rapid growth in the consumption of the product. It was in the late teens that the company’s approach to advertising also changed, certainly as a result of the sale to Breitenbach. Prior to the sale, the company only advertised to the medical practitioner in trade journals and circulars, a course of action that was stipulated in their contract with Dr. A Gude & Co. of Leipzig. Section 9. 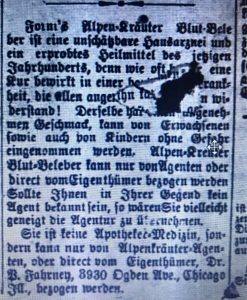 And it is further agreed between Dr. A Gude & Co. party of the first part and the M.J. Breitenbach Co. party of the second part, that if at any time the said M.J. Breitenbach Co. by device or by advertising attempt to increase their business in Gude’s Peto-Mangan other than through the recognized channels to the Medical Profession then in such event this contract is to become null and void and all rights of the M.J. Breitenbach Co. existing under this instrument immediately become the property of said Dr. A. Gude & Co. without recourse to law. In 1917, the company, now owned outright by Breitenbach, launched a national advertising campaign targeting general newspapers across the country. 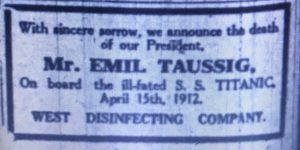 This advertisement, which appeared in the June 11, 1917 edition of the Pittsburgh Press, was part of that first wave of ads that appeared that year. 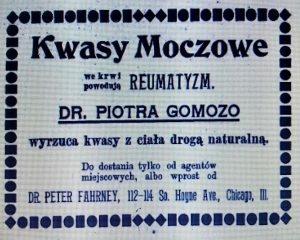 Based on this advertisement, in the October 1920 edition of the National Druggist, they were still using the trade publications as well, but now they were highlighting their advertising campaign to the druggists with no mention of the uses or benefits of the product itself. Both liquid and tablet form are now being extensively advertised in the newspapers of this country. Stock both and be prepared for increased trade. After Breitenbach’s death in 1920, the business continued to be listed at their Warren Street address up through at least the late 1920’s. 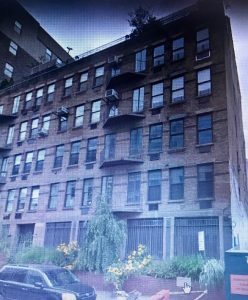 By the early 1930’s they were listed at 160 Varick Street and later in the 1940’s and early 1950’s 304 East 23rd Street. Then sometime after the early 1950’s the brand was acquired by the Natcon Chemical Co who was operating out of Bethpage New York on Long Island. 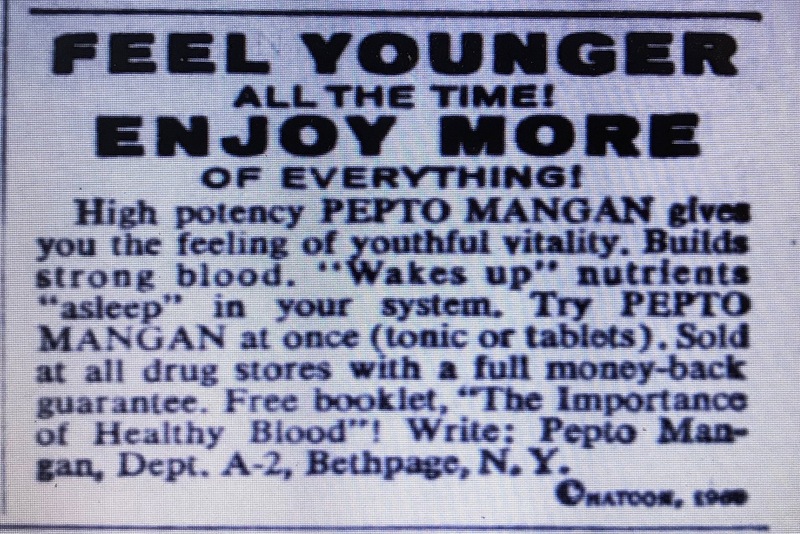 Pepto-Mangan was still being sold in the early 1960’s. 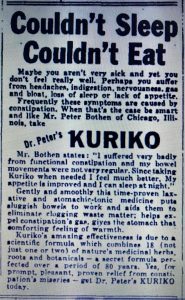 The last advertisement I can find for them was in the June 6, 1960 edition of the New York Daily News. 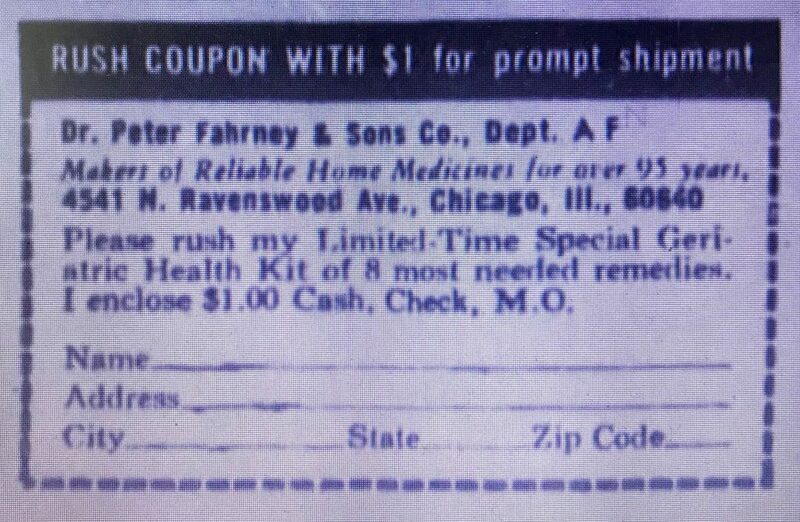 I’ve seen Pepto-Mangan included in advertised drug store price listings as late as 1964. The bottle I found is machine made, hexagonal in cross-section and contained 11 ounces. It matches the bottle shown in a number of the newspaper advertisements that appeared between 1917 and 1920. Author baybottlPosted on April 21, 2018 May 31, 2018 Categories Patent MedicineTags ABM, antique bottle, August A Gude, Leipzig Germany, M J Breitenbach Co., Natcon Chemical Co.
Sloan’s Liniment was originally a veterinary product developed by Andrew Sloan to topically treat sore and lame horses. 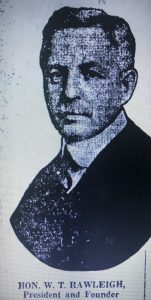 Andrew’s son, Earl S. Sloan, is credited with initially putting it on the market as a remedy for human ills and developing it into a world wide product that is still available today. 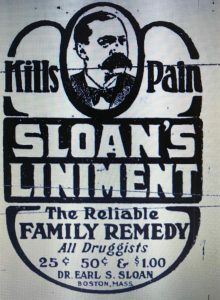 Earl’s likeness has been included prominently on Sloan’s Liniment labels from the very beginnings of the business. 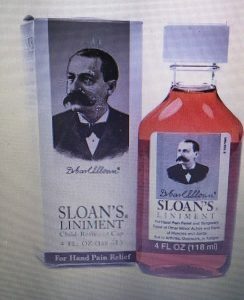 The formula for “Sloan’s Liniment,” said Dr. Sloan, was my fathers. He was one of the chief surgeons and Inspectors of Stock during the Civil War, and it was in that work that he developed and made use of the liniment. 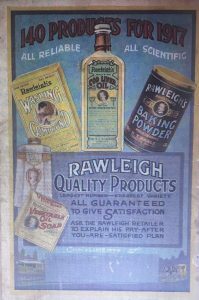 As a young man I was in the horse-trading business and made the liniment simply for my own use, but it became so popular with friends and neighbors that I resolved to go into the liniment business exclusively. According to census records and limited city directory information, Earl’s father, Andrew, lived in Zanesfield Ohio (1840’s to 1860’s), where Earl was born in 1848 and later in St Louis Missouri (1870’s). By 1880, Earl had moved to Boston where his business took root. A publication entitled “Commercial and Financial New England Illustrated,” published by the “Boston Herald’ in 1906, described the early history of the business. Whoever knows the ills of the horse, the noblest of beasts, knows the value of Dr. Earl S. Sloan’s Liniment and Veterinary Remedies, which, through extensive advertising and their own merit have become the leading remedies of their kind in the world since their introduction in 1885. When Dr. Sloan put Sloan’s Liniment and Veterinary Remedies on the market, he had only one small room on Portland Street. This room was used for an office, and the remedies, which were then strictly veterinary, were manufactured in a laboratory in the suburbs. The company was incorporated in 1904 with a capital of $50,000 and employs a force of sixty-four persons. The officers of the firm are Dr. Earl S. Sloan, president; Foreman Sloan, vice president; Andrew Sloan, treasurer; Mrs. Bertha P. Sloan, director, and Archie MacKiegan, clerk. This history was well supported by the Boston City Directories. Sloan was first listed in the Boston directories in 1880 and by 1882 he was listed at his first Portland Street location, 166 – 175 Portland, where he remained until 1887. 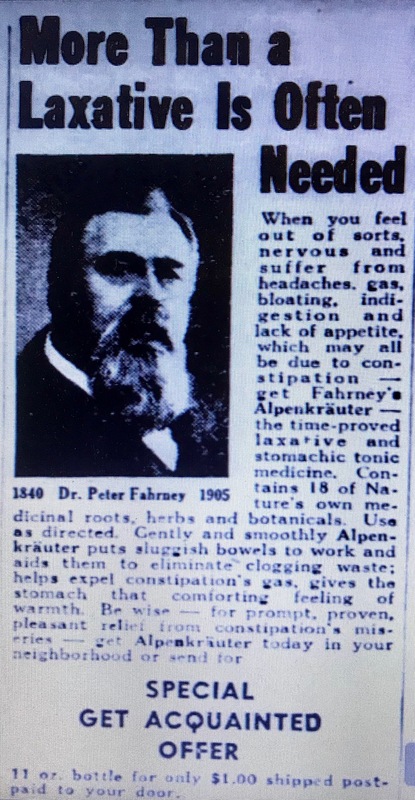 This advertisement in the March 6, 1886 edition of the Black Hills (South Dakota) Daily Times confirmed that by this time Sloan’s Liniment was not just being marketed as a veterinary remedy. 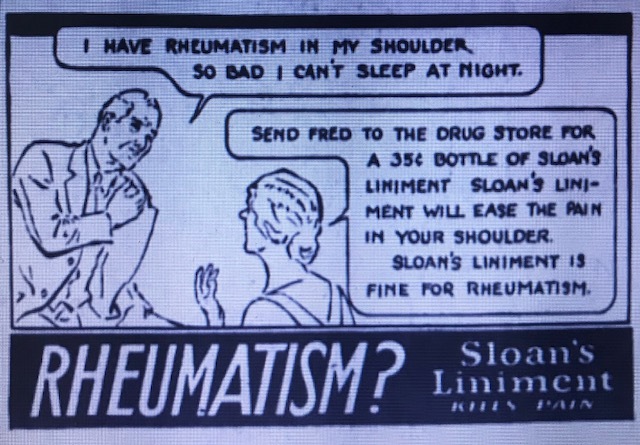 The man or woman that has rheumatism and fails to keep and use “Sloan’s Liniment” is like a drowning man refusing a rope. He was subsequently listed at his second Portland Street location, 132 Portland, by 1889. His first Albany Street address was listed in 1897 at 597-599 Albany and later, by 1905, he was listed at 615 Albany. The business was still located at 615 Albany in 1913 when Sloan sold the company to the Pfeiffer Chemical Company. The July 31, 1913 edition of “Printer’s Ink” reported the sale. 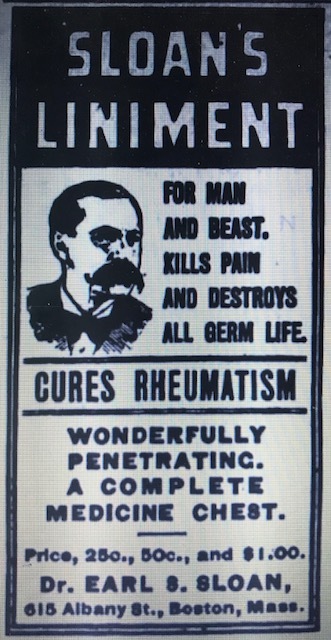 During most of Earl Sloan’s time heading the company, Sloan’s Liniment was advertised as both a farm and home remedy – “cures all pain in man or beast.” An advertisement included in several southern U.S. newspapers in 1898, makes the same point with a little more flair. A beautiful woman and a handsome horse appeal to every southerner’s heart. 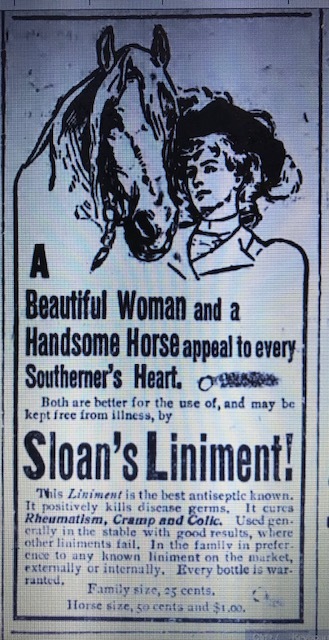 Both are better for the use of, and may be kept free from illness, by Sloan’s Liniment! For years I put every dollar I could possibly take out of the business back into advertising. This meant, of course, an increasing expenditure each year until today we utilize practically all mediums, and even issue a magazine of our own, known as “Sloan’s Farm and Home Journal,” of which we send out millions of copies annually. According to the “Printer’s Ink”story, the business depended on signs and billposting for every-day reminders and on newspapers and booklets for educational work. 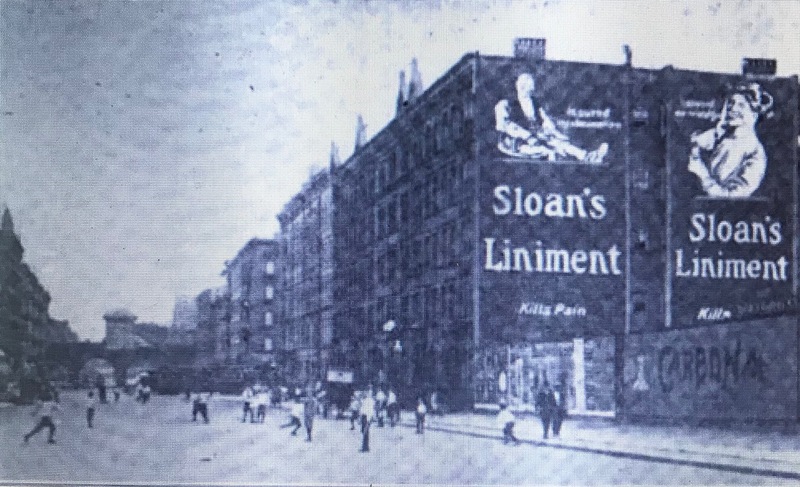 The words “Sloans Liniment” were always the most prominent feature in his newspaper and outdoor signage. We believe that in that way we teach the public to unconsciously connect the two in their mind. 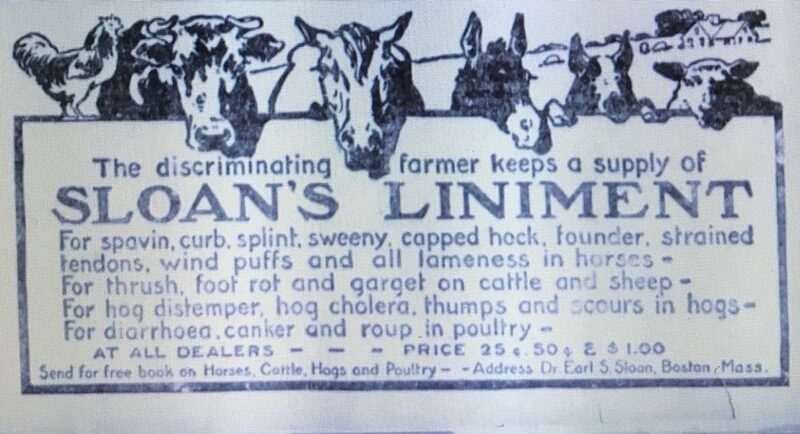 Whenever they think of liniment they think of Sloan’s. He went on to describe the world-wide recognition the product was receiving in 1910. Yes, we advertise in foreign countries, as much proportionately as in the United States, using mostly newspapers, outdoor advertising and some street car advertising. Our business in England, Germany, South America and the West Indies is increasing so rapidly that it is hard for us to keep up with it. 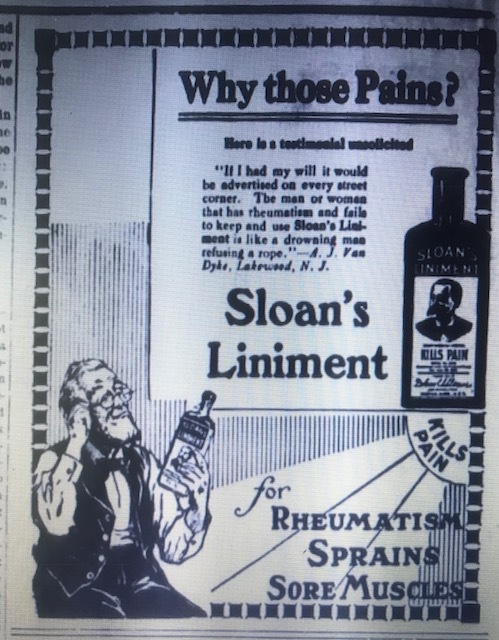 The long history of “Sloan’s Liniment” suggests that it’s value as a liniment also contributed to it’s success but the company’s advertisements marketed it as much more than just a liniment. 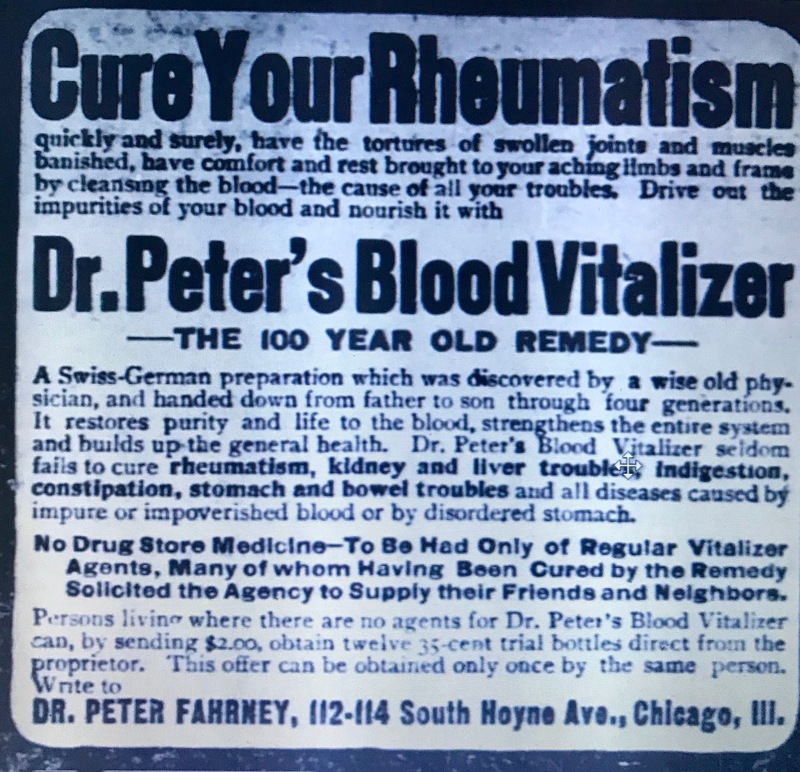 One 1905 advertisement called it “a complete medicine chest” and another, this one from 1920, listed 26 human conditions for which the liniment offered relief. 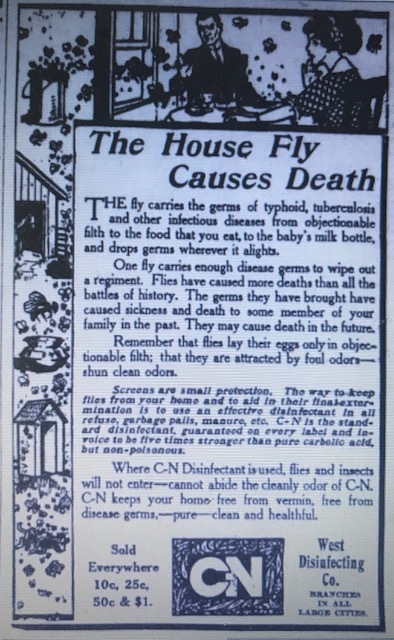 Advertisements in 1905 even advertised it as a preventative for yellow fever and malaria. Use the great antiseptic preventative Sloan’s Liniment. Six drops of Sloan’s Liniment on a teaspoonful of sugar will kill yellow fever and malaria germs. Farmers were also in luck. 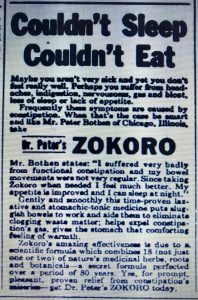 This 1908 advertisement announced it brought relief for various ailments associated with horses, cattle and sheep, hogs and poultry. 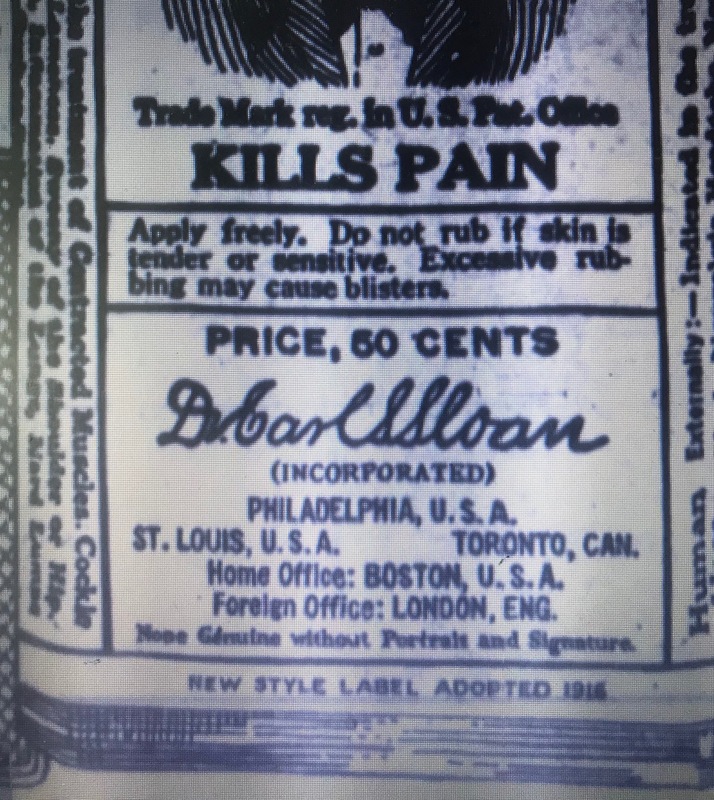 After Sloan sold the business it continued to operate under the name Dr. Earl S. Sloan, Inc., and they continued to list Boston as their home office on the “Sloan’s Liniment” label through 1916. The label also listed locations of Philadelphia and St. Louis in the U.S.; Toronto, Canada, and London, England. Then in 1917, the label was revised, dropping the Boston location and adding New York. 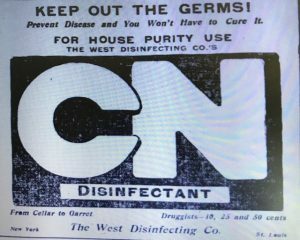 According to an article in the October 15, 1945 edition of the Atlanta Constitution, around that time 14 companies, including the Pfeiffer Chemical Co., and Dr. Earl S. Sloan, Inc. were consolidated under the name Standard Laboratories, Inc. The 1948 NYC Directory listed Standard Lab’s Inc. at the 113 West 18th Street address. 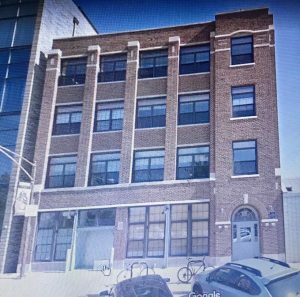 In fact, Standard Lab’s was listed at that address as far back as the early 1920’s so it appears that the relationship between Sloan, Pfeiffer and Standard Lab’s probably dated back much further than the consolidation. Built in 1913, the building utilized by the business at 113 West 18th Street still remains today. By the early 1950’s Standard Laboratories, Inc. was located in Morris Plains N.J. According to bestbusinessny.com the company has been inactive since the mid 1980’s. 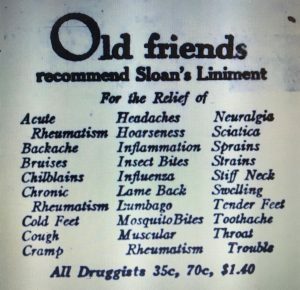 Sloan’s Liniment continues to be made today by Lee Pharmaceuticals and according to drugs.com, it’s still used for temporary relief of muscle or joint pain caused by strains, sprains, arthritis, bruising or backaches. 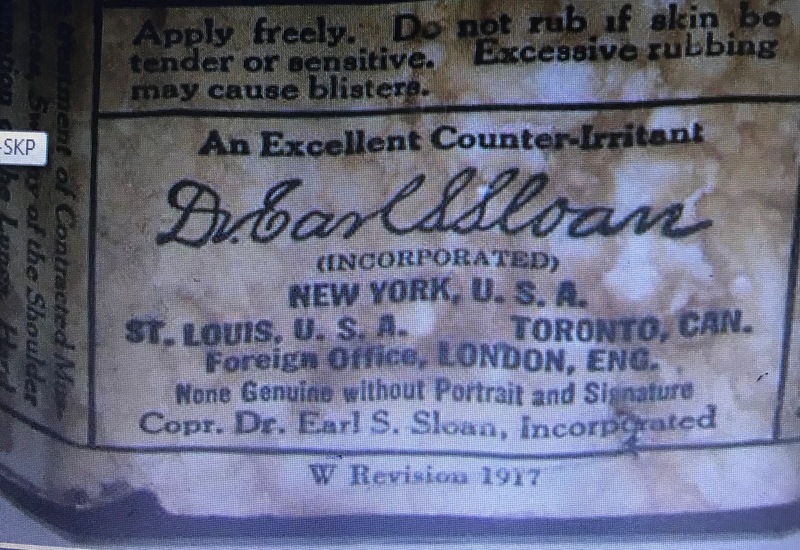 Over 130 years later, the packaging still includes Earl Sloan’s likeness on the label. I’ve found two “Sloan’s Liniment” bottles, both three ounces in size. 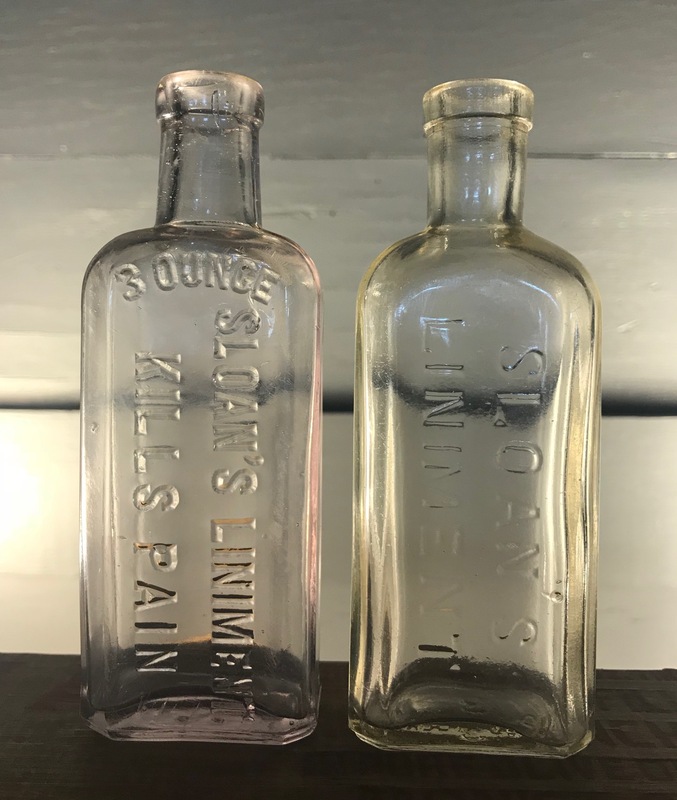 One is mouth blown and Embossed “Sloan’s Liniment / Kills Pain” that was probably made prior to Earl selling the business in 1913. The other is machine made, only embossed “Sloan’s Liniment” and most likely dates to the period following the sale. C.H. Dahl & Sons, Sweet Clover Dairy, Roosevelt, L.I. 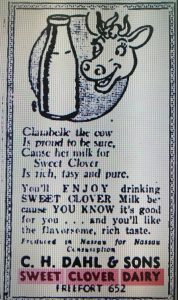 According to Sweet Clover Dairy advertisements published in later years, Charles H. Dahl founded the business in 1888. 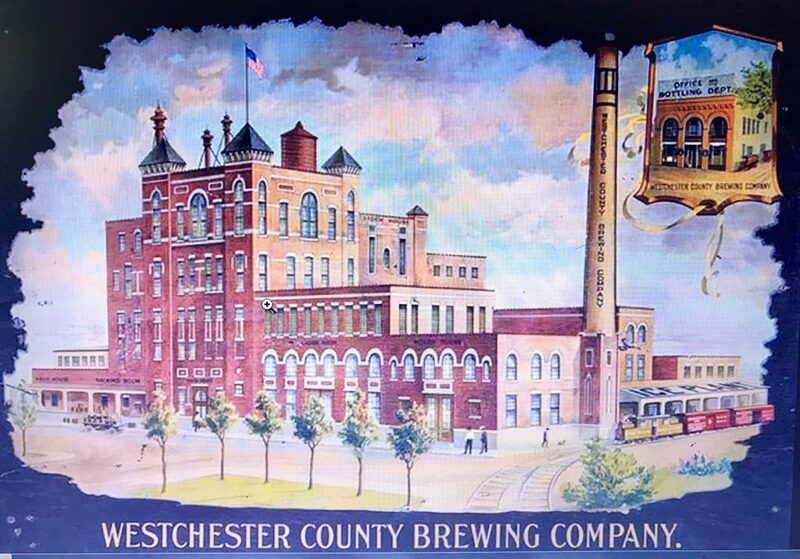 Originally located in Brooklyn, Dahl moved to 200 Nassau Rd in Roosevelt, Long Island sometime in the early 1910’s. Dahl was not listed in the Brooklyn directories during the initial years but census records from 1900 listed his occupation as a “milk dealer” living on Linwood Street in the East New York section of the borough. A wholesale milk dealer, according to a story in the October 15, 1903 edition of the Brooklyn Daily Eagle entitled “Jail for Selling Bad Milk,” that year he was convicted and sent to jail for selling adulterated or impure milk. No. 2545 A permit to sell milk at the north side of Linwood Street, 165 feet south of Stanley Avenue. Nonetheless, Dahl remained in East New York, Brooklyn through at least 1910. Census records from 1910 listed him as a “dairyman” living on Barbey Street, also in East New York. Charles Dahl who runs the dairy on Washington Avenue, Roosevelt, was arrested Thursday on complaint of Health Officer Runcie of Freeport on the charge of putting wrong labels on bottles. The case was reported to the State Board of Health and the State Sanitary supervisor, Dr. Overton of Patchogue, made an additional inspection with Dr. Runcie and after an analysis of the milk forbade Dahl using any labels marked Grade A, and gave him one week to get labels marked Grade C. Dr. Runcie states that three days later they found Dahl again carrying milk in the Village of Freeport labeled Grade A, and therefore a warrant was sworn out for his arrest. He was taken before Judge Norton, who held him under $200 bail for examination before the Grand Jury. Bail was furnished by his father. The fact that his father bailed him out leads me to believe that it was actually Charles, Jr. who was arrested. Despite this early transgression, the company seems to have enjoyed a long and successful history in Roosevelt. Charles Sr. was still listed as the proprietor in the 1940 census records, but it appears that during much of their time on Long Island, it was Charles Jr. who managed the business. Frederick, was also involved but apparently not at the same level of responsibility. 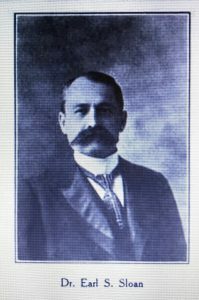 In 1888, Sweet Clover Dairy was founded by Charles H. Dahl. For the past 30 years, his son, Charles H. Dahl Jr., has built expanded and modernized the plant, facilities and methods of operation of Sweet Clover Dairy. A.S. Mott has sold his milk business to C.H. Dahl of Roosevelt, who will operate the route in connection with his present milk business. One of Sweet Clover Dairy’s advertising slogans was “Produced in Nassau for Nassau Consumption” and by the mid 1940’s, in addition to routes in Roosevelt and Freeport, they were also operating routes in the Nassau County communities of Lynbrook, Oceanside, Rockville Centre, Baldwin, Merrick, Hempstead and Uniondale. Since last year the Sweet Clover Dairy has constructed the most unique milk processing plant on Long Island. Unique in respect that the complete milk processing operation, (without the touch of a human hand) is done in front of large plate glass picture widows, open at all times to the public’s eye. The invitation included this rendering of the new plant and from appearances the business had come a long way from their Department of Health issues of the early 20th century. Charles H. Dahl Jr died in May 1971 and his wife continued to own the business for a number of years after his death. As far as I can tell the Sweet Clover Dairy was still in operation at 200 Nassau Road as late as 1979 and possibly longer. The dairy was apparently located at the terminus of Washington Ave in a triangular plot formed by Nassau Road, Babylon Turnpike and West Centennial Avenue. Today that area is occupied by the Roosevelt Senior Center and there is no sign of the former dairy. The bottle is a machine made, round quart bottle. It’s embossing includes the Roosevelt L.I. location so it dates no earlier than 1910 to 1915. Based on this 1940 advertisement, the dairy was still using the round bottle type in the early 1940’s. 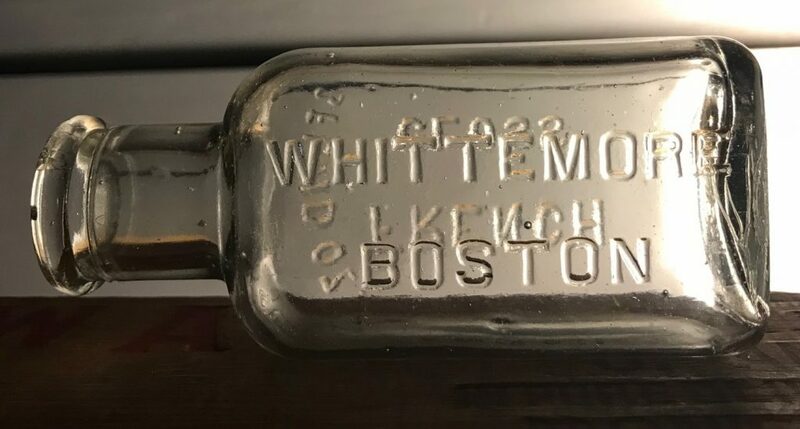 By the late 1940’s, their advertisements exhibit a square bottle with a cream top. This range is confirmed and further refined by the makers mark of “A.B.C.2” embossed on the bottle. It stands for the Atlantic Bottle Co., who, according to information on the Society of Historical Architecture’s web site, used that mark between 1918 and 1931. The Whittemore name was associated with shoes and blacking going back at least as far as 1850. That year, census records listed Daniel Whittemore as a shoemaker located at North Bridgewater, Plymouth, Massachussets. Ten years later, in the 1860 census records, he listed himself as a blacking maker still located in North Bridgewater. Sometime in the late 1860’s or early 1870’s, Daniel Whittemore’s sons, John Q.A. 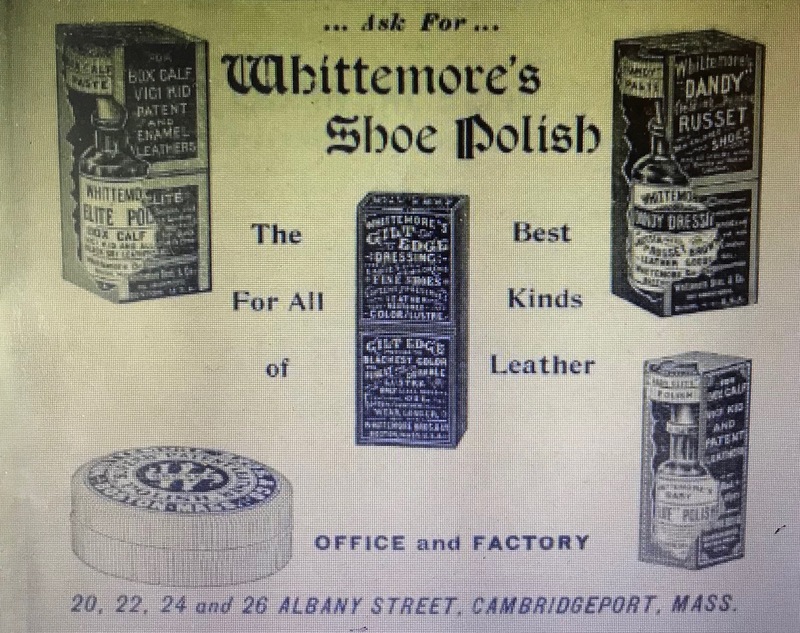 and Charles Whittemore established the company of Whittemore Brothers & Co. That business was first listed in the 1873 Boston City Directory as manufacturers of leather dressings with an address of 100 Lincoln. The two Whittemore brothers along with a third partner, W. Augustus Paine, were named as proprietors. 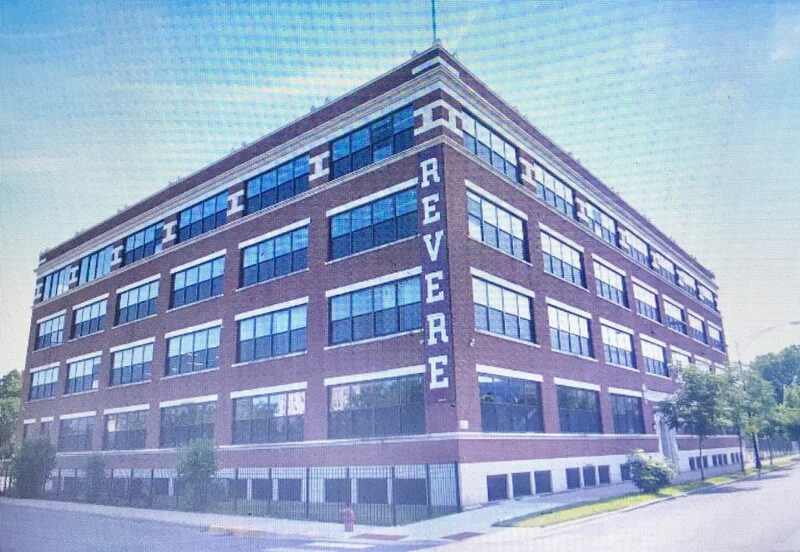 The company was listed in Boston with a Lincoln Avenue address up through 1889; first at 100 Lincoln and later from 1874 to 1889 at 176 – 184 Lincoln. Then by 1891 they had moved to 237 Albany Street, also in Boston, where they remained until 1901. In 1902 the company apparently moved across the Charles River to Cambridge Mass. The 1902 Boston directory included an advertisement that located them in Cambridgeport. The following year, in 1903, the company was first listed in the Cambridge City Directory at 20 -26 Albany Street. (Apparently there are two Albany Streets; one in Boston and another in Cambridge.) The directory that year also included an advertisement that mentioned both an office and factory at that location. The business remained listed on Albany Street in Cambridge up through at least 1947. Up until 1905, the business listed their address as 20 Albany Street, then 84 Albany Street and ultimately 68 -92 Albany Street changing their name to Whittemore Bros. Corp. sometime around 1915. “GILT EDGE” Oil Polish. Blacks and Polishes ladies’ and children’s boots and shoes. SHINES WITHOUT RUBBING; always ready for use. “ELITE” combination for those who take pride in having their shoes look A-1. Restores color and lustre to all black shoes. “BULLY SHINE.” A waterproof paste polish for all kinds of black shoes and rubbers. Blacks, polishes, softens and preserves. Contains oils and waxes to polish and preserve the leather, also Russet Bully Shine. “DANDY” combination for cleaning and polishing all kinds of russet or tan boots and shoes. 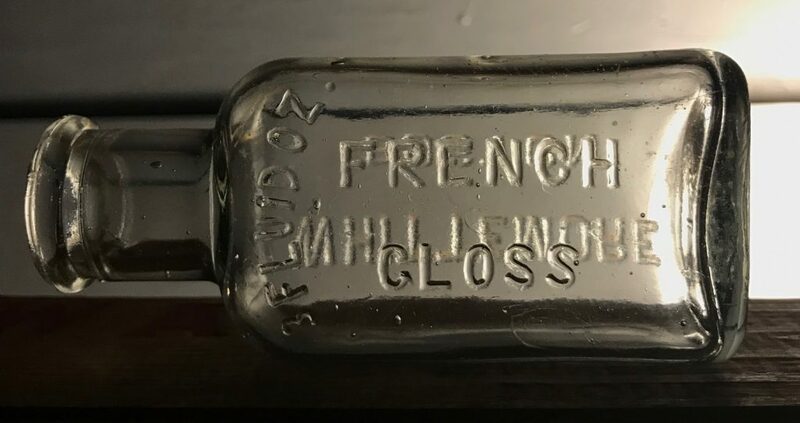 “FRENCH GLOSS.” For blacking and polishing ladies’ and children’s boots and shoes. SHINES WITHOUT RUBBING. “BOSTON.” A black liquid polish for men’s and boys’ shoes. Produces a patent leather polish without brushing. “BOSTON” is excellent for cleansing old rubbers. “LIGHTNING DYE” instantly blacks all colored shoes. “SUEDEDENE” for cleansing and recoloring all kinds and colors of suede and ooze leather footwear, also Black and Castor. In powder or liquid form. Powders in patent sifting top cans. An advertisement from 1930, specific to the “French Gloss” brand stressed that it “Shines Without Brushing” and focused on children’s shoes. It is very easily applied, dries quickly, covers those annoying scuffs which children have in footwear and can be used also on rubbers. 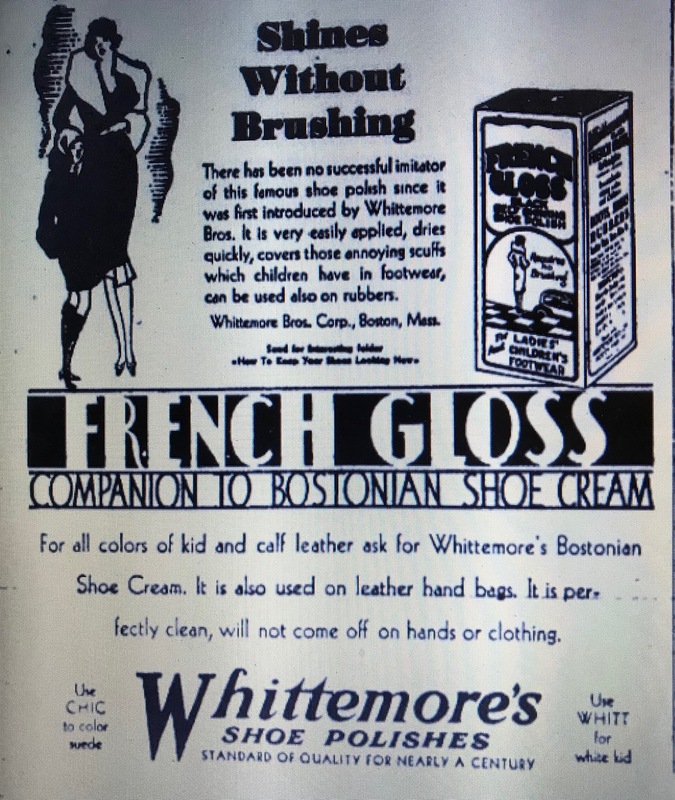 It’s not clear when “French Gloss,” was first introduced as a Whittemore brand. An item called “French Gloss for Ladies’ Shoes” was included in an advertisement for a store named Jewett’s in the November 30, 1869 edition of the Buffalo (N.Y.) Daily Courier so its possible that the brand dates back to the origins of the business. 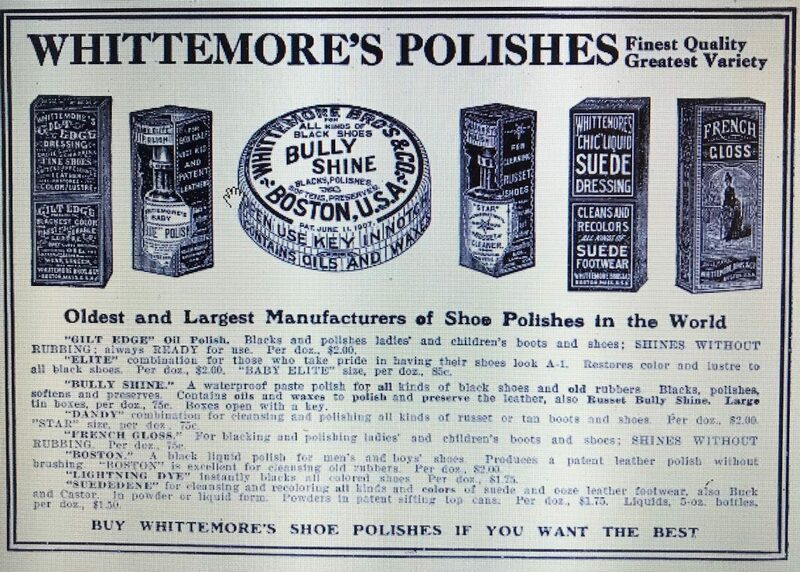 That being said, I can’t positively associate the brand with the Whittemore name until the 1890’s. It continued to be advertised into the 1940’s. According to “Difford’s Guide,” the relationship between the Booth family and gin can be traced back to the establishment of their London distillery in 1740. After the death of the last male Booth family member in 1826, the firm became an independent limited company. In 1937, Booth’s joined the Distiller’s Company Ltd, the interests of which would evolve into part of the conglomerate we know today as Diageo. Booth’s gin is not currently listed as a brand on Diageo’s web site, apparently having gone out of production just recently. 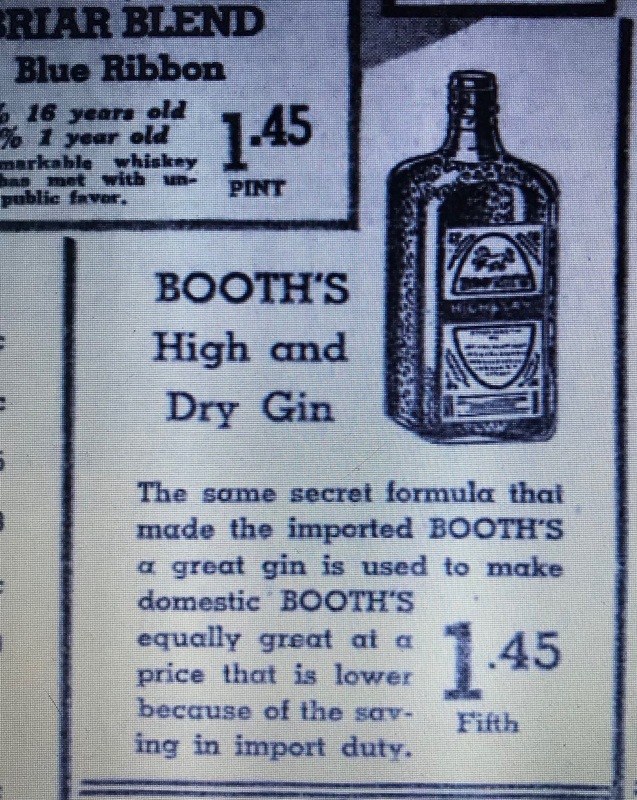 It’s not clear when Booth’s gin first began appearing in the United States. The earliest U. S. newspaper reference for Booth’s gin that I could find is in a December 4, 1871 story in the Buffalo Daily Courier highlighting a local business called P.J. Hanour’s. It mentioned that “Holland” gin and Booth’s “Old Tom” gin were both available by the case at Hanour’s. Based on this story, its safe to say that Booth’s “Old Tom” gin was certainly available in the U.S. by the early 1870’s. The December, 1887 edition of Bonfort’s Wine and Spirit Circular listed the firm of Purdy & Nicholas as the U.S. agent for Booth & Co.’s “Old Tom” gin. An import company, the business was a partnership of John F. Purdy and George Stevenson Nicholas. According to Purdy’s obituary the company was established in 1857, so while it’s not clear when their relationship with Booth’s began, it’s possible that Booth’s U. S. presence dates back that far. Always located at 42 Beaver Street in lower Manhattan, Purdy & Nicholas was listed in the New York City directories from 1862 up until 1888. According to an item in the September 12, 1894 issue of the New York Times, the partnership was dissolved on September 1, 1888. Subsequently, Nicholas continued to run the business, first as a sole proprietor, then, sometime around 1908, as G. S. Nicholas & Co. and finally in 1919 as G.S. Nicholas & Son. Throughout this time the business remained listed at the Beaver Street address. By the early 1900’s, in addition to “Old Tom” their Booth & Co. imports also included Booth’s “Dry” gin. 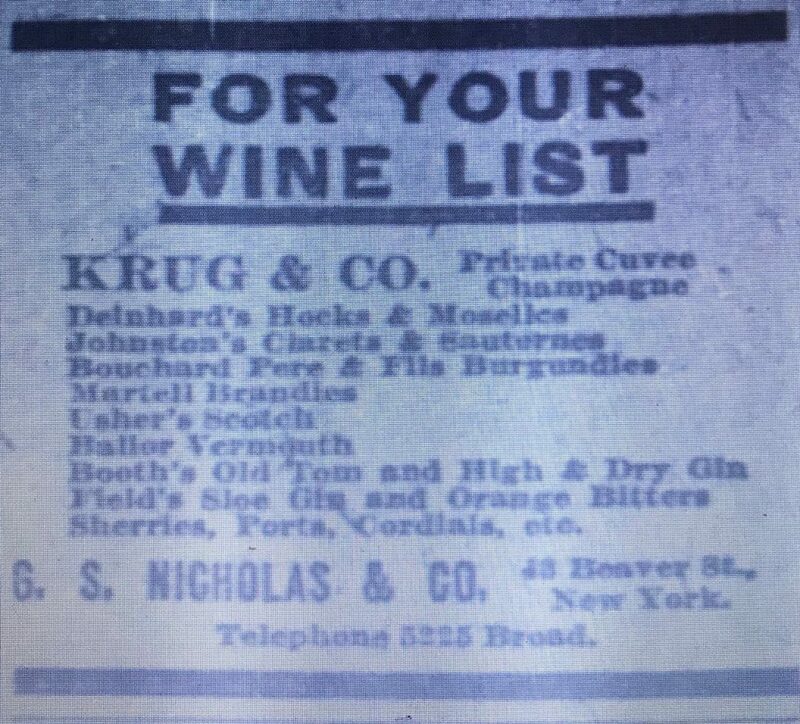 A 1902 advertisement in Life Magazine named G. S. Nicholas as the sole agent for Booth’s Dry Gin. 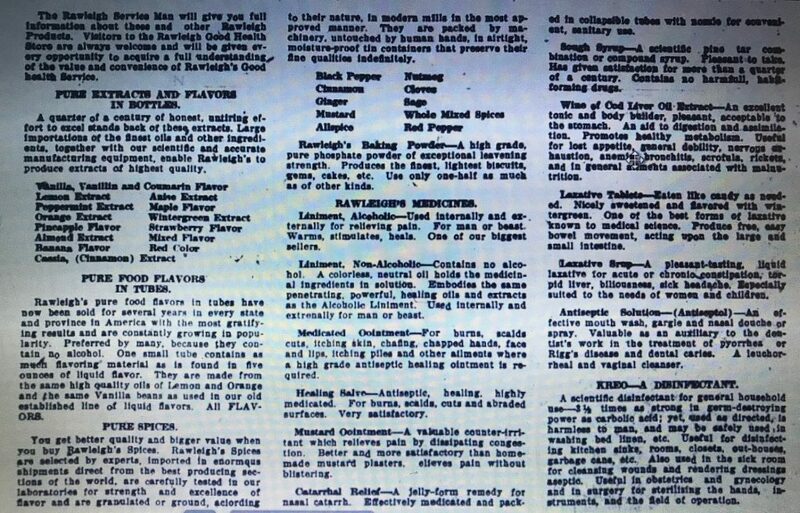 And the brand was included in the company listing under gin, printed in the January 1, 1903 edition of the Wine & Spirit Bulletin. By 1908 the brand name “High and Dry” gin began to appear in the U. S. as a Booth & Co. product. That year, the June 17 edition of “Printers Ink” announced that the firm of H.B. Humphrey had been hired to place advertisements for the brand. A year later G. S. Nicholas & Co. included the Booth’s “High and Dry” brand along with Booth’s “Old Tom”in an advertisement published in the June 22, 1909 edition of the New York Times. In 1919, the NYC Copartnership and Corporation Directory named G. S. Nicholas & Son as the agent for Booth Distillery, Ltd., confirming that their relationship remained intact right up to the start of National Prohibition. 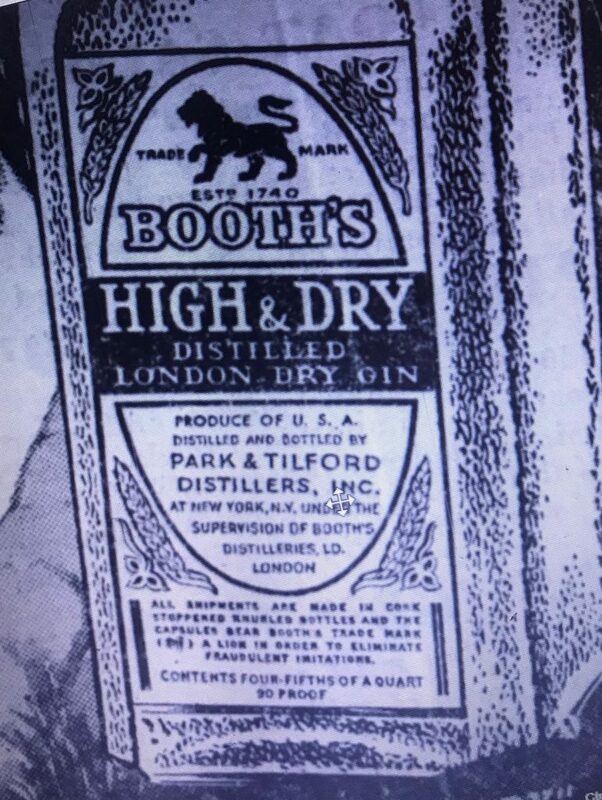 Booth’s High & Dry gin continued to be available in the U. S. during Prohibition albeit illegally. One story in the (Wilmington Delaware) Evening Journal described a shipment that originated in Canada. Eighteen days ago a fourteen ton, two-masted schooner cleared from the little port of St Pierre Miquelon, a French possession near Newfoundland, with a crew of seven and assorted choice liquors valued at upwards of $200,000 aboard. Search of the schooner was made during the night. Bottles, cases and kegs of liquor were found in two hatches covered with bags of coal. The small schooner is (now) berthed at a Delaware River pier in Philadelphia, heavily guarded. The cargo of liquor lies in concrete vaults of the U. S. Customs Department. Apparently Booth’s “High & Dry,” in addition to being smuggled in, was also being counterfeited in this country. A story in the April 7, 1928 edition of the Decatur (Illinois) Herald referred to one illegal operation as the “Decatur Branch” of the Booth Distillery, complete with a still, bottles and labels. 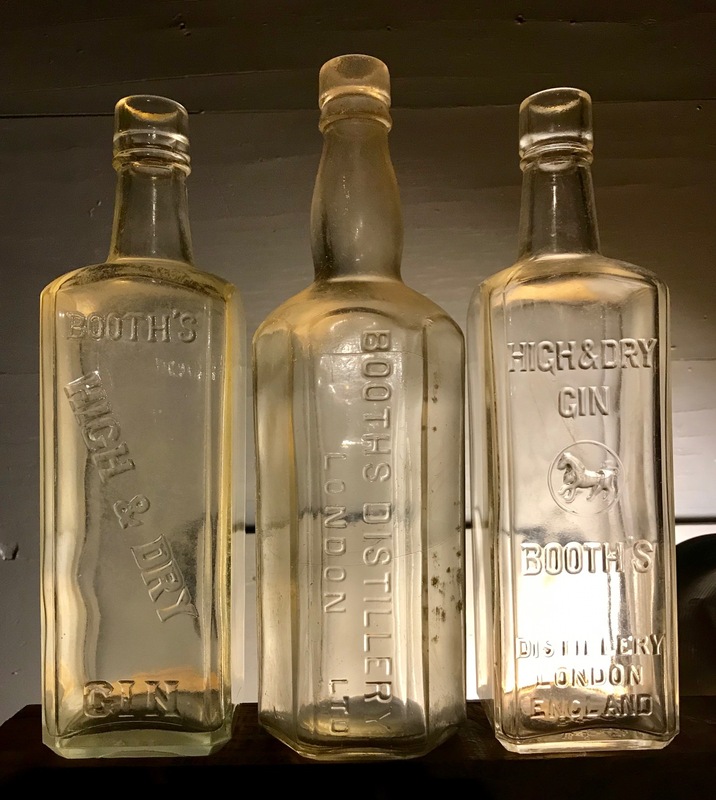 Police Friday raided the “local branch” of a London, England, distillery: makers of Booth’s “High and Dry” Gin, and other fine imported liquors. A new 50-gallon still was confiscated. Swooping down on the cottage in 2129 North Church Street, they found John Alexander and his wife Sadie, in charge of the premises with 80 gallons of raw alcohol ready to be converted into choice imported liquors. Bottles, labels, corks and seals were ready. Recipes for mixing a widely assorted list of liquors were found. Booth’s London distillery, as described by the labels for use on the “imported” dry gin, made in Decatur, was established in 1740. The British lion appears on the label as a trade mark. The label is a work of art, printed in four colors. The still was in the basement. It gave appearance of being recently installed. Under order of Chief Ed Wills, it was wrecked. product of U.S.A. distilled and bottled by Park & Tillford Distillers, Inc. at New York, N.Y., under the supervision of Booth Distillers, Ld, London. Other 1930’s advertisements explained that reducing the price by eliminating the import tax was the reasoning behind the change. This is the same gin when imported retails $3.50 to $4.00 per fifth bottle. But it is now being distilled by the Park and Tillford distillers in New York City by the Booth’s distillers of London, England, same formula, same gin, but eliminating import tax, thereby bringing the price down compared to ordinary gin. This advertisement from 1935 bore this out, listing the price of a fifth at $1.45. 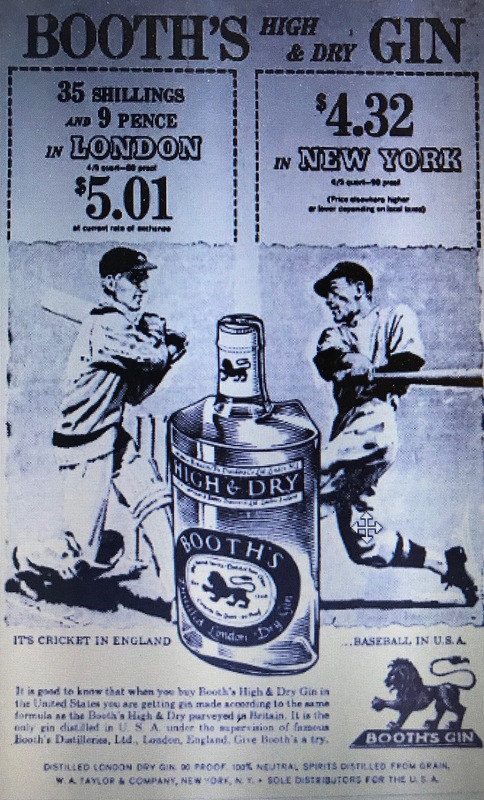 By the mid-1950’s, Booth’s “High & Dry” gin was being produced in Linden New Jersey by the Distillers Co., Ltd.; W. A. Taylor & Co., was named as their sole distributor in the U.S and the bottle design had completely changed but this 1959 advertisement showed that their marketing strategy had remained pretty consistent. They still stressed their English heritage. 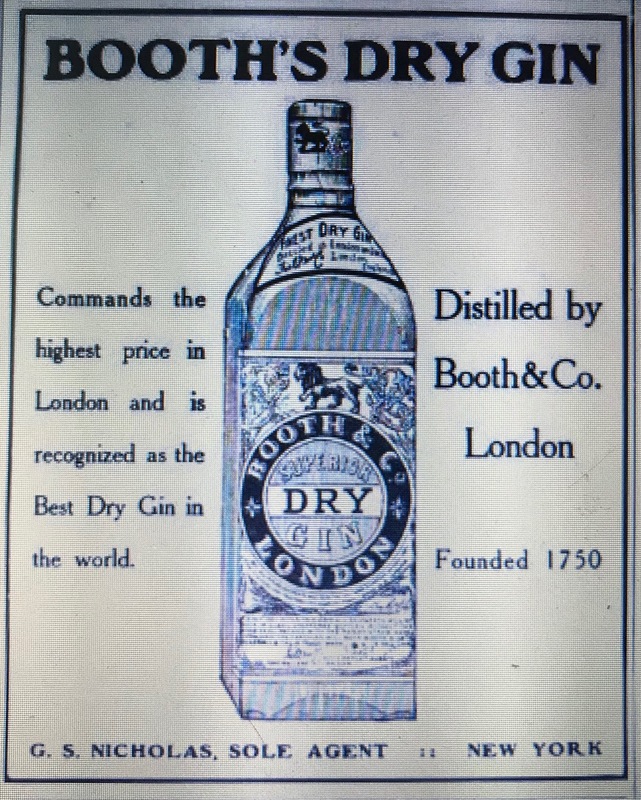 It is good to know that when you buy Booth’s “High & Dry” Gin in the United States you are getting gin made according to the same formula as the Booth’s “High & Dry” purveyed in Britain. It is the only gin distilled in U.S.A. under the supervision of famous Booth Distilleries, Ltd., in London, England. Give Booth’s a try. And price was still a major factor. They don’t include the typical post-prohibition embossed phrase (federal law forbids the sale or reuse of this bottle). As a result these bottles were most likely manufactured after 1908 when the brand “High & Dry” began to appear in the U.S and before the end of National Prohibition. This is further supported by the embossing: “B & CO.LD.,” found on the base of each bottle. 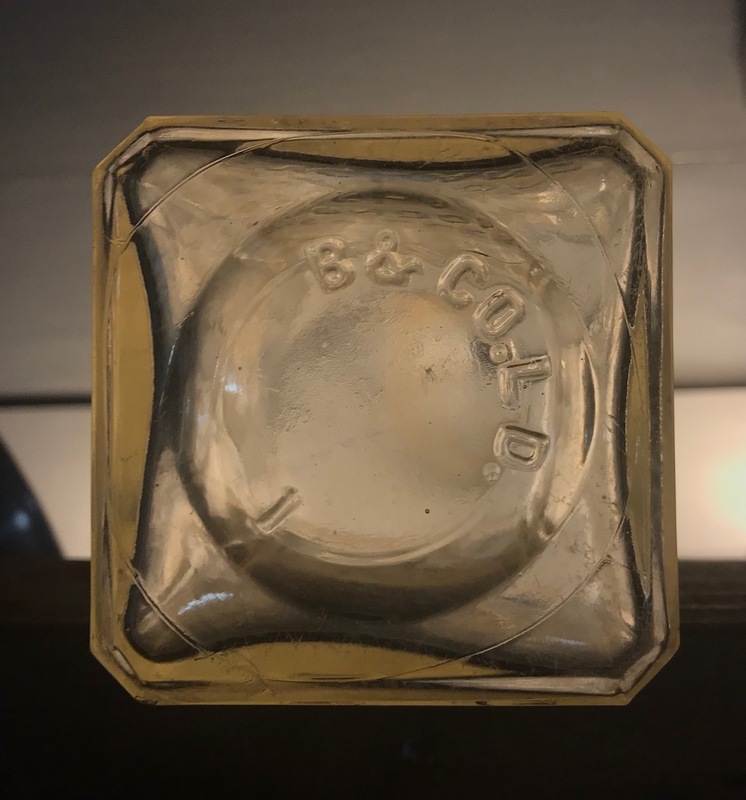 Originally I thought that this stood for Booth & Co., however, I now think it’s the makers mark for “Bagley & Co., Ltd.,” an English glass house, that was in business from 1898 to 1962. 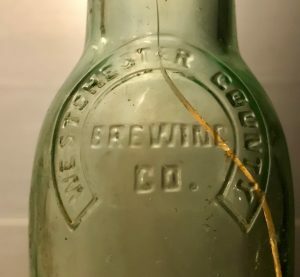 The company manufactured bottles from 1898 to the late 1920’s or early 1930’s after which they ceased bottle production and focused on tableware. According to the U.S. Society of Historical Architecture they were one of the first users of automated bottle machinery in England and probably had the capability of making machine-made narrow-mouthed bottles as early as 1907. This puts the range of production between 1908 and the early 1930’s and means that the bottles could have been legally imported by G.S. Nicholas or they could have entered the country illegally during Prohibition.